Greetings to everyone! 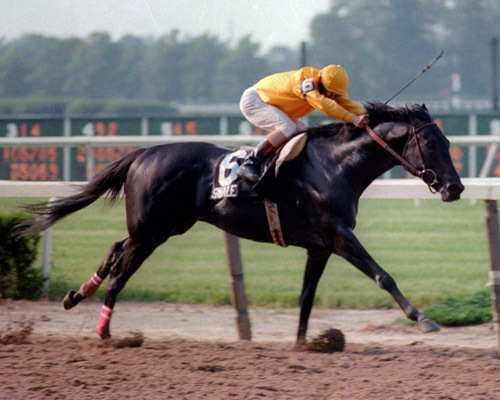 I would like to take this time to thank each and every one of you for visiting my website which is dedicated to the memory of one of Seattle Slew's greatest and most beloved sons, SWALE. Swale exemplified the phrase, "Heart of a Racehorse." No thoroughbred racehorse, past or present, put forth the effort he did. He fought relentlessly with every inch of his being to win races. His incredible courage is vividly captured in a book that I have written entitled: GRIT AND VALOR: THE STORY OF SWALE. In this book, I Describe Swale's life in a most detailed manner. I recall his foaling, breaking, early training and fine tuning. Then, I take the reader inside the starting gate of each and every one of Swale's fourteen races, and carry them all the way through to the finish line. You will feel as if you are the jockey as Swale storms to victory in some of the sport's most famous and classic races. Afterward, I describe his untimely passing and the inquest that followed. Finally, I try to answer the question: WHAT MIGHT HAVE BEEN? had Swale been allowed to finish out his racing career and enter stallion duty. I storngly believe that you will really enjoy this book. It is a must read for any animal lover, sports fanatic, or horse racing enthusiast. Once again, many thanks for visiting my website. Ckeck back often, because I will be adding many new items as time passes. PLEASE SEND ME FEEDBACK! I would really appreciate your comments. Click HERE To Order From Timothy J. Thompson Personally And Receive Two FREE Gifts!